Juniper Springs campground is part of Ocala National Forest. This forest is in the state of Florida in the northern central part. The campground is located on route 40 which runs in an east west direction and is very straight. This campground was constructed in about 1935 and was updated a few years ago. The work was done by the civilian conservation corp more commonly known as the CCC. I believe the current facilities were reconstructed around 2010. They provide the same functions but, with improved materials. The functional differences are that the lights are only in the high ceilings and there are no electrical outlets. The showers are now equipped with water saving devices that when pushed turn on for a short time. The new facilities are very clean, allowing maximum use of the sun and provide shelter in case of a tornado or severe storm. I am a tent camper, but if I were in a camper I would feel safer in a shelter. We have all seen pictures of the aftermath of tornadoes and storms, they are scary. There is a spring on the campground where the water comes out of the ground at about 68 F. The water is crystal clear. This water area for swimming. It is very similar to an in ground pool. There are steps leading into the water. The depth of the water exceeds 4 feet in a small area. The excess water flows out and through a water wheel that used to power a millhouse. The power generated was used for electricity – an early example of green energy being used. The millhouse is now a small museum and it no longer produces electricity. For many years I visited Florida during the months of January, February, and March for periods of 4 to 8 weeks. The temperature has varied between 50 and 80 F during the day. Occasionally at night the temperature has dropped to 20, resulting in water left on the picnic table would freeze. Such cold temperatures can sometimes cause the pipe from the ground supplying water for the site to remain frozen until about 9 am before the water resumes working normally. The Florida Trail passes through the campground. The trail at this point goes in a north south direction. It is mostly flat but the difficulty comes when walking through what is known as “sugar sand”. The faster you try to walk the more you tend to slide back and this becomes strenuous. The trails throughout the campground are well groomed by volunteers who exchange work for a campsite. A newly trimmed trail will be about 8 feet wide. This is very helpful for spotting snakes or alligators. During the months I have been in Ocala I have not seen any alligators and only a few snakes. There is a stream in the park where the park service has established a canoe and kayak launching area, with a receiving area further down stream. The stream is only navigable by canoe or kayak. There are some low over hanging branches and the stream is very narrow. Travel is in the down stream direction only. The campground rents equipment and does do a pickup. Campers with their own equipment can be picked up downstream for a fee. 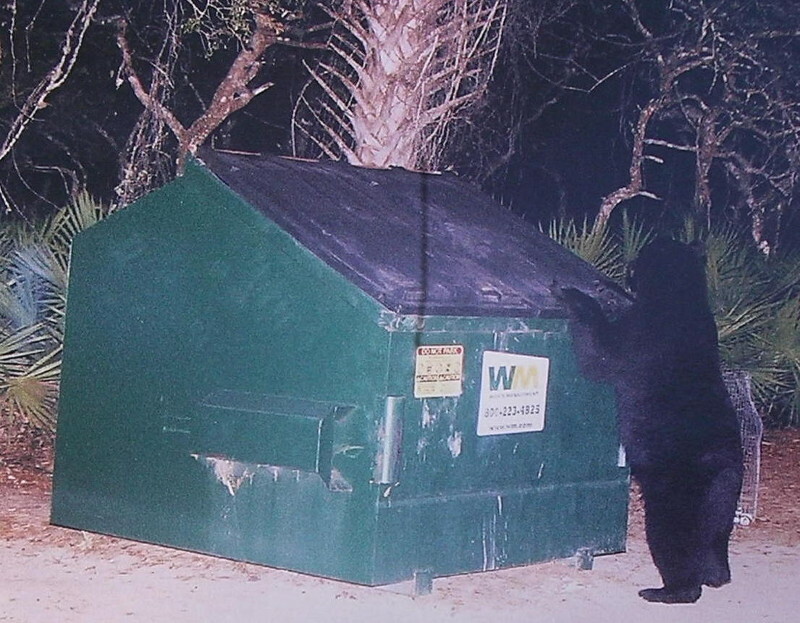 There were bears and raccoons every time I camped in Ocala. The attraction for them is food and there is always enough either from carelessness or easy access to the dumpsters. I’ve only seen bears just after sunset around the dumpsters. They did not seem interested in humans. In fact they would run when a human approached. The raccoon are bolder and I have seen them almost anytime. It was always nice to walk around the campground in the evening. Very often when some of the campers would have a bonfire going. Someone would always invite us to join in and share stories. The conversations were always interesting and usually humorous. A few times when it got cold in the evening these fires were a blessing. There are some farmer’s markets and a flea market less than 20 miles south of the campground. These are large and open 1 or 2 days a week. While we could get ice at the campground, if they were out, it was less than 2 miles to the nearest place that sold ice. The nearest grocery stores are about 20 miles east on route 40. Along this road are also a public library, laundromats, and various restaurants. Silver Springs located to the west on route 40 has glass bottomed boats through you can view the water wildlife. To the north is a place called Salt Springs. The Villages which is south of the campground had a population of over 100,000 in 2013. The Villages is one of the largest age restricted communities in Florida as well as the world. This is my favorite campground in Florida because the campers and staff are so happy and helpful. acquaintances to visit your website particularly 3 times every week to learn the newest things you have got.